The story of Atalanta Imports is told at their current (2017) website, http://www.atalantacorp.com/our-story.php "The story of Atalanta Corporation begins with Herbert Moeller and Leon Rubin, two businessmen looking to fill a void in the U.S. domestic food importing market. 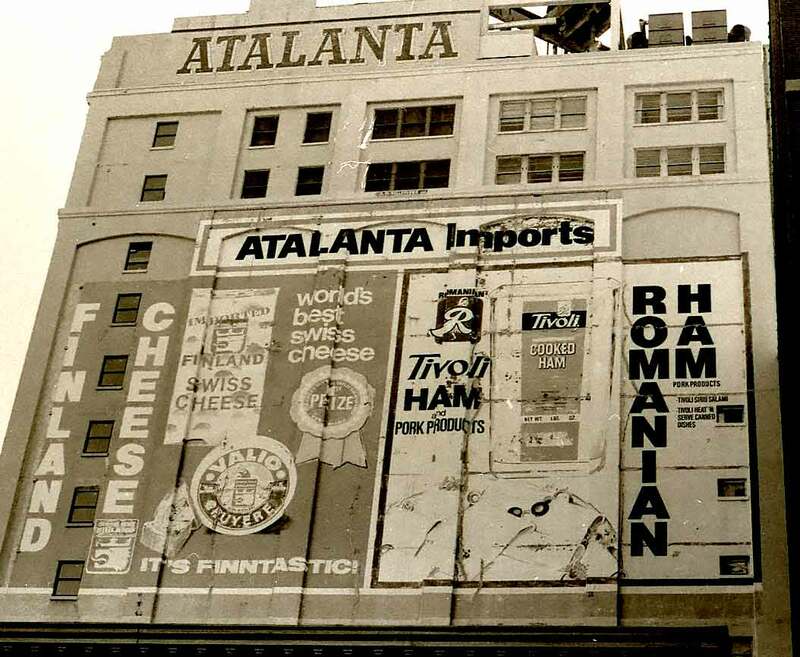 Originally billed as Atalanta Trading Corporation in 1945, the company quickly made their mark as one of the industry's biggest importers of canned hams from Poland, Denmark and Germany and Quick Frozen Seafoods. The company's rapid growth due to their success compelled them to move offices twice in New York City, starting on Beaver Street, then moving to 77 Hudson Street and finally settling at the iconic 17 Varick Street building for the next thirty years." Featured on the sign are Finland cheeses, including Finland "Swiss" cheese and Valio Cruyere cheese ("It's Finntastic!"). There are also Romanian ham and pork products, branded Tivoli. Tivoli products include Tivoli Siriu salami and Tivoli Heat'n Serve canned dishes. In 1947 an article in the New York Times about frog legs and lobster tails imported from Cuba named Atalanta as the importer. "Six hours after it left a quick-freeze plant in Cuba, the first sizable shipment of frog legs and lobster tails to come from that country arrived at La Guardia Field yesterday, the cargo of a Pan American Airlines DC-4. ... The Atalanta Trading Company, importers of the two products, says the speed of air transportation makes it possible to keep them in top condition." In November 1962 the trade journal Quick Frozen Foods wrote, "Two new sizes of rock lobster tail packages are now being marketed by Atalanta Trading Corp., N. Y., as a result of nationwide surveys made among both retailers and consumers. The two sizes, an 8-oz. package containing two rock lobster tails, and a 1 lb. 4 oz. carton containing four to six tails, provide the retailer with a balanced line to satisfy all consumer needs, said Harry Kaufman, vice president in charge of seafoods. Both packages are sold under Atalanta's new 'Celebrity Brand' label." This ad for the Celebrity Brand label appeared in April 1963. Atalanta Trading Corp. began in 1945 in an office at 82 Beaver St., New York City. They moved to 91 Wall St. in 1946 and then to 71 Hudson St. in 1947. This classified ad for Atalanta Trading Corp. appeared in the New York Times 24 April 1947 when the business was located on Hudson St.
From 1954 to 1964 the New York telephone directory listed them at 3 Harrison St. and 77 Hudson St. Then in 1964 they moved to the building pictured above, 17 Varick St. / 25 North Moore St. They were located here until 1997. In 2002 the telephone directory listed Atalanta Condo at 25 North Moore St., as more and more of New York's older buildings were converted to residential use. The founders of Atalanta Imports were Herbert Berkemeyer Moeller (1897-1970) and Leon Rubin (1911-1986). Herbert B. Moeller was born 9 November 1897 in Brooklyn, N. Y., and died 1 April in New York City. He met his end in an apartment fire, apparently as a result of smoking in bed. As told in the New York Times, 2 April 1970, pg. 58, "Herbert B. Moeller, the retired president of the Atalanta Trading Corporation, a food importing company at 17 Varick Street, was found dead in his bed early yesterday after firemen extinguished a blaze in his sixth-floor apartment in the Hotel One Fifth Avenue in Greenwich Village. The police said Mr. Moeller, who was 72 years old, had apparently died of smoke inhalation. They said the blaze had started in a stuffed chair in the living room at about 2 A. M. Mr. Moeller, who was born in Brooklyn, studied meat-processing methods in Europe and in 1945 co-founded Atalanta." Leon Rubin was born 14 February 1911 in St. Petersburg, Russia, and died 7 August 1986 in Scottsdale, Arizona. His obituary notice in the New York Times, 8 August 1986, pg. D15, read, "Rubin - Leon, passed away August 7, 1986 in Scottsdale, Arizona. He was the Founder and Chairman Emeritus of Atalanta Corp., a large food importing firm based in Manhattan. Born February 14, 1911 in Russia, Mr. Rubin served in the U. S. Army and in Military Intelligence Service during World War II. He was decorated with Combat Infantry Badge, a Purple Heart, a Bronze Star and a European Campaign Ribbon. He also spoke 9 languages and was an award winning breeder of champion pure bred Arabian Horses. With the founding and growth of Atalanta Corp., he received a certificate of appreciation from the Mayor of New York City for his outstanding contributions to New York's business community and to the promotion of East-West Trade. He is survived by his bereaved wife, Doris, living in Scottsdale, and his loving daughters, Joan, Barbara and Vivien. Funeral services will be held at Stevens and Finnerty Funeral Home in Great Barrington, Mass., on Sunday, August 10, 1986 at 12 Noon. In lieu of flowers, contributions in his memory may be made to Alzeimers Disease and Related Disorders Foundation, 6122 North 7th St., Phoenix, Arizona 85014. Remembered with great love and affection by his family, friends and co-workers, he was a man of great honesty, integrity, and generosity. May the memory of his life and achievements be a blessing to all who knew him."